Professor Rex Brynen of McGill University’s Department of Political Science offered his students the opportunity to storify their class assignments for his international political science class using InkleWriter. This is a simple text-based tool, allowing you to branch your story in many direction. Games can be accessed from within this blog post. Anthropy, A. (2012). Rise of the videogame zinesters : How freaks, normals, amateurs, artists, dreamers, dropouts, queers, housewives, and people like you are taking back an art form (Seven Stories Press 1st ed.). New York: Seven Stories Press. As far as essays go, this reads like a novel. I could hardly put it down, Anna frames making games as something anyone can (and should) do, so one feels like they are the protagonist in this story. The text as a slight self-help or therapeutic slant, but I quickly got over that (it is, after all, part of the DIY you-can-do-it-too message). because different forms are suited to different kinds of expression, and some are more effective at communicating in certain ways than others. Broadly, films and photographs are best sited for communicating action and physical detail. Novels are best suited for communicating internal monologue and ambiguity. In chapter 3 further examining what are games good for, Anna establishes that “a game is an experience created by rules” (emphasis in her text). Using the games of Tag, Tetris and chess (european and viking), Anna highlights these characteristics of games, such as creating “house rules” (on-the-fly variations to a game). the format of the videogame-which lets rules be changed and introduces over the course of the experience, and which lets the author hide the causes for events and show only the effects-lends itself more easily to an overt, sustained narrative than any physical game format. I like the discussion surrounding folk games (like Tag), commercial games (Anna refers mostly to high-budget commercial games, such as first-person shooter games or elaborate adventure games, as the archetype of this category), role-playing games (such as in-person dungeons and dragons) and “zine” games. But you have to wait until chapter 5 (“the new videogame”) for Anna to get to talk directly about the role of the author of a game (at p. 102). For example, in commercial games, the producer has the most impact on the narrative structure of a game, but they are the most removed from the actual creation of it as huge teams are deployed in their creation. In folk games, the author is all but forgotten, as the game has entered into our common cultural experience. Rarely are authors of games known or remembered for their contribution. – ZZT (DOS based ASCII game maker). I sent off to learn more on gamification, eLearning and other related topics. I setup an quick and dirty bibliography on the topic and shared it from my RefWorks site. Annetta, L. A., & Bronack, S. C. (Eds.). (2011). Serious educational game assessment : Practical methods and models for educational games, simulations and virtual worlds. Rotterdam, Netherlands: Sense Publishers. Haythornthwaite, C. A., & Andrews, R. (Eds.). (2011). E-learning theory and practice. Los Angeles: Sage. Hirumi, A. (Ed.). (2010). Playing games in school : Video games and simulations for primary and secondary classroom instruction (1st ed.). Eugene, Ore: International Society for Technology in Education. Juwah, C. (Ed.). (2006). Interactions in online education : Implications for theory and practice. London ; New York: Routledge. Suits, B. (2005). The grasshopper games, life and utopia. Peterborough, Ont. : Broadview Press. Werbach, K., & Hunter, D. (Eds.). (2012). For the win : How game thinking can revolutionize your business. Philadelphia: Wharton Digital Press. I also have another open bibliography on business information literacy. I learned so much from the e.SCAPE conference at Concordia – but professor Hirumi inspired me to look into grounding the curriculum I am developing for business information literacy in proven theories. Prof. Hirumi’s chapter in this book is available here. Based on the belief that the learning of facts, concepts and principles occurs best in context of how they will be used, the Interplay strategy evokes emotions and sparks imagination, based on cognitive neuroscience research, to enhance experiential learning theories by addressing three primary conventions of interactive entertainment and their related elements (i.e., Story – characters, events, worlds; Game – rules, tools, goals; Play – stimulus, response, consequences). 1. Expose – Exposure provides the back-story to entice empathy for the character or player, and orients the audience into the same reference point or point of view. Exposure sets up specified learning objectives in a meaningful way to invite the student to contribute, to engage and to achieve the challenges set before them. 2. Inquire – Inquiry validates Exposure. If exposure sets a desire to learn, then inquiry is automatic. Inquire provides a response to student’s curiosity with something to do that showcases different elements that will be used later. 3. Discover –Discovery provides the personal reward, achievement, and the “ah ha” moment. The consequences of discovery, whether negative or positive, provide feedback to inspire further exploration to the next level of achievement. 4. Create – Transforms the experience from being merely reactive to truly interactive. Instead of responding to cues, the learner contributes to the content by applying the elements of the subject matter in novel ways. 5. Experiment – Provides an opportunity to assess learning and provide feedback without losing or winning. The goal is less about the hypothesis being right or wrong, but rather setting up the elements of the subject matter so that new knowledge can be gained. Failure should be fun. 6. Share – The sharing of personal experiences and feelings is facilitated at the end of the lesson or unit, to seal the memory of the learning experience. Sharing compels learners to put lessons learned in their own perspective as well as others. Crippen, K. J., Archambault, L., & Kern, C. (in press). Using Scaffolded Vee Diagrams to Enact Inquiry-Based Learning. In A. Hirumi (Ed.). Grounded Designs for Online and Hybrid Learning: Practical Guidelines for Educators and Instructional Designers. Eugene, WA: International Society for Technology in Education. Hirumi, A. (2002). Student-centered, technology-rich, learning environments (SCenTRLE): Operationalizing constructivist approaches to teaching and learning. Journal for Technology and Teacher Education, 10(4), 497-537. Hirumi, A. (1998, March). The Systematic Design of Student-Centered, Technology-Rich Learning Environments. Invited guest presentation given at the first Education Graduate Students and Academic Staff Regional Meeting, Guadalajara, Mexico. Hirumi, A. (1996, February). 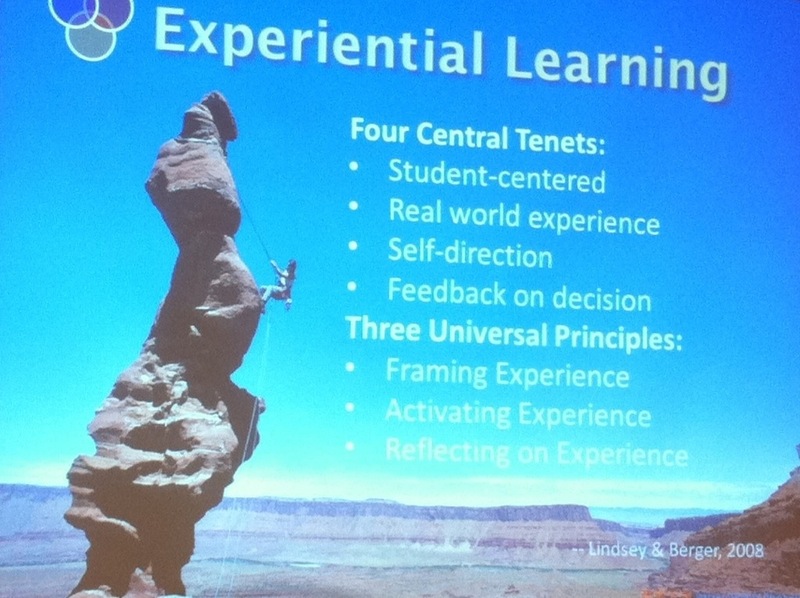 Student-Centered, Technology-Rich Learning environments: A cognitive-constructivist approach. Concurrent session held at the Association for Educational Communication and Technology Conference, Indianapolis, Indiana. Hirumi, A. & Stapleton, C. (in press). Designing InterPLAY Learning Landscapes to Evoke Emotions, Spark the Imagination, and Foster Creative Problem Solving. In A. Hirumi (Ed.). Grounded Designs for Online and Hybrid Learning: Practical Guidelines for Educators and Instructional Designers. Eugene, WA: International Society for Technology in Education. Hirumi, A., Atkinson, T., Stapleton, C. (2011). Interplay: Evoking Emotions andSparking Imagination through Story, Play and Game. Concurrent Session presented the annual Association for Educational Communication and Technology conference, Jacksonville, FL. Nov. 8-12. Stapleton, C. & Hirumi, A. (2011). 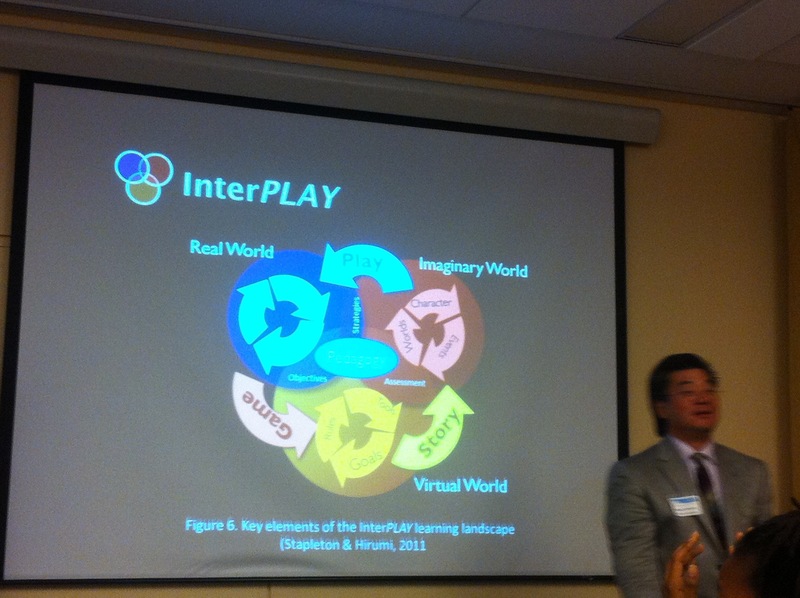 Interplay instructional strategy: Learning by engaging interactive entertainment conventions. In M. Shaughnessy & S. Fulgham (eds). Pedagogical Models: The Discipline of Online Teaching (pp. 183-211). Hauppauge, NY: Nova Science Publishers, Inc. 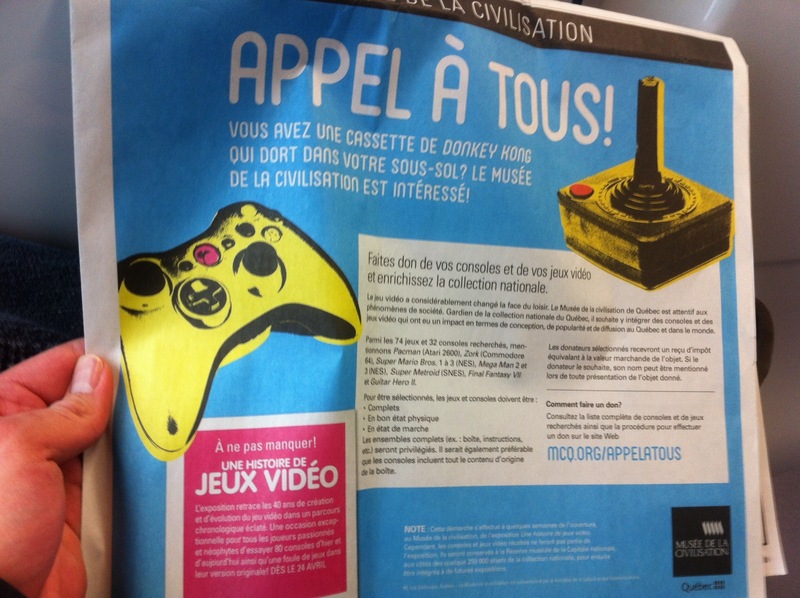 Essentially, the Musée de la civilisation de Québec has issued a plea to get donation of antique video game consoles to build a heritage grade collection. Video games first appeared on the scene in the early 70s. Still a relatively new medium, they have evolved and improved continuously to become a major cultural industry today. The history of video games is also the history of graphic and industrial design as reflected in console styling, fan magazines, and packaging and advertising. The exhibition creates authentic period ambiances using a variety of visual supports including objects associated with the games themselves. Adapted by Musée de la civilisation based on an exhibition by Réunion des musées nationaux – Grand Palais in collaboration with Musée des Arts asiatiques Guimet and Association MO5.COM. You have until March 2014 to get to Québec City. Utena A. and M. Miskiniai Public Library in Lithuania has received funding to expand their innovative Play to Study service, which includes an educational computer game for vulnerable children, to more than 50 schools in nine municipalities, reaching 7,000 children. Here is the link to Scratch, the kid (and neophyte) friendly video game builder. I’ve been thinking of using video games or gamification for library & information literacy instruction and the Scratch tool seems like a fun and easy way to test some prototypes. I like the simple game dynamic, it reminds me when I first learned how to code on Hypercard on an Apple II way back in the early 1990s. Essentially, you are placed in a situation and the system prompts you for a few options. I also really like the idea of putting the player in the shoes of a call center operator. So, here is a simple concept of my game: You are the libarrian ™ in which you play a (maybe) stereotypical librarian that is faced with questions from users. That way, the player would need to learn what we know in a role-playing, cognitive dissonance inducing on-the-spot way. It is like taking a multiple-choice test, but with (possibly) jokes and a dynamic kitch-spartan interface. What more could you need ? I was not in a time machine. I was at the Reacting to the Past Institute at Barnard College, one of the most exhilarating new methods of revolutionizing higher education that I have experienced. Reacting to the Past (RTTP) is a series of elaborate games, set in the past, where students take on the roles of historical characters, and through arguments and gameplay, have the potential to reshape history. In order for students to “win” the game, they have to thoroughly master literary and historical texts for their games’ time period, and to be able to fight against their in-game opponents through a series of oral presentations and written work. In other words, students in Reacting to the Past have to basically do everything their professors want them to do in a college class—read and analyze texts, learn about historical contexts, learn how to construct forceful and convincing arguments—but in the guise of a game. I played two characters in two games—a follower of the Ming Confucian extremist Hai Rui in Confucianism and the Crisis of the Wanli Emperor , set in 1587, and an undiscovered, young Walt Whitman in 1845 in Frederick Douglass and Abolition . This reminds me of “role playing” in the old Dungeons & Dragons sense, but also the psychology-based trick to foster empathy.